If you're planning to do some extreme lowering (ie. air bags) on your S-10 or G-Body then these SuperTravel� front upper ball joints are your savior! These SuperTravel� front upper ball joints are a "quantum leap" in ball joint technology. The housing is angled and the internals are completely revised for additional travel. 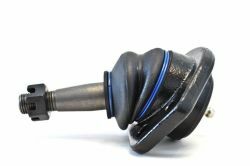 No more cutting your front upper a-arms, the SuperTravel� front upper ball joints outperform pie cut front upper a-arms. They can be used in conjunction with our tubular front upper a-arms for insane travel and laying the frame on very large wheels. The ball stud is constructed from 4130 chrome moly and is heat treated for maximum strength. Forged SAE1045 housings were chosen for ultra-high stud pullout ratings, and the housing is sealed with our signature ring-retained, accordion-style boot. We also selected a larger ball head diameter for improved wear characteristics and added strength. The housings are electrocoated black for a sleek, durable finish that can pass a 240 hour salt spray test.